The debate continues to rage over minimalist running shoes and the pros and cons of minimalist running. Dr. Mark Green, a top Kansas City podiatrist, has said all along that these type of running shoes offer big risk with very little reward. More and more studies are concluding that Dr. Green has been right all along. The theory behind the minimalist running shoe is that striking the pavement forefoot first requires less oxygen and effort, reduces stress in the heel and provides more natural shock absorption. 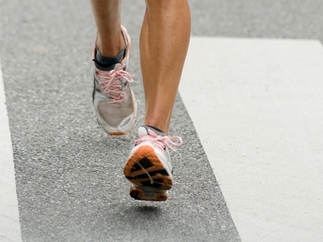 The forefoot gait is also supposed to allow a person to push off harder and run longer. The University of Massachusetts Amherst studied this theory and their findings did not bode well for the minimalist running shoes. Allison Gruber, a postdoctoral fellow in charge of the study found that runners who struck with their heels first actually used less oxygen to run at the same pace as forefoot strikers. The findings also concluded that forefoot running also caused a person to “hit the wall” faster than heel striking runners, because of the way the stride caused people to burn more carbohydrates. Another study, and the one that concerns Dr. Mark Green the most, surveyed 566 runners asking them if they had tried minimalist shoes. A third of the runners stated that they had tried the minimalist shoes and, of those, 32% said they suffered injuries as a result of the shoes. Many of those surveyed actually had gone back to traditional running shoes after trying minimalist shoes. Why is the risk of injury so high? 70% of runners naturally hit the pavement heel first. Forcing a stride change can cause people to be unstable when they are running and this can lead to overuse injuries such as tendonitis and stress fractures. Dr. Green has seen an increase in these injuries as a result of people forcing themselves to change how they naturally strike the pavement. Dr. Green’s message is a simple one – do what comes natural. If you naturally hit the forefront of your foot first, then minimalist running shoes may be right for you. If you are like the majority of runners out there and you use your heel to strike the pavement first, pass up the minimalist running shoe fad. The risk of injury isn’t worth any perceived benefit. No matter how your foot strikes the pavement, if you are experiencing pain while running, call Kansas City Foot and Ankle to set up an appointment.